Robert Simmons and his cat Survivor were stuck in their New Bern home when floodwaters began to rise. The News & Observer in Raleigh reported that Robert Simmons Jr. was among those seeking refuge Friday afternoon in New Bern, a city near the coast that's bordered by two rivers and has been swamped with water. 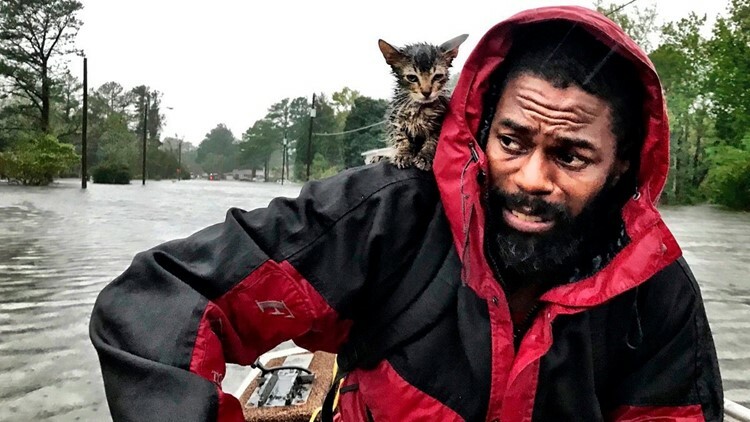 Robert Simmons Jr. and his kitten "Survivor" are rescued from floodwaters after Hurricane Florence dumped several inches of rain in the area overnight, Friday, Sept. 14, 2018 in New Bern, N.C.
Andrew Carter, the reporter who took the photo, said he had almost stopped covering the boat rescues before meeting Robert and Survivor. Officials say hundreds of people in New Bern have been pulled from high water. At 2:30 p.m. Saturday, the city that all water rescues had been completed.